Fullmetal Alchemist is one of the most well-known and renowned anime in history, and it easily makes its way onto the favorite lists of many anime fans, even over a decade after the original manga began its run in 2001. However, its great reputation is only matched by how confusing its adaptations were. Although it was originally adapted in 2003 as an anime, due to the incomplete nature of the manga at the time, the following anime had to sharply diverge from its source material in order to complete its run. 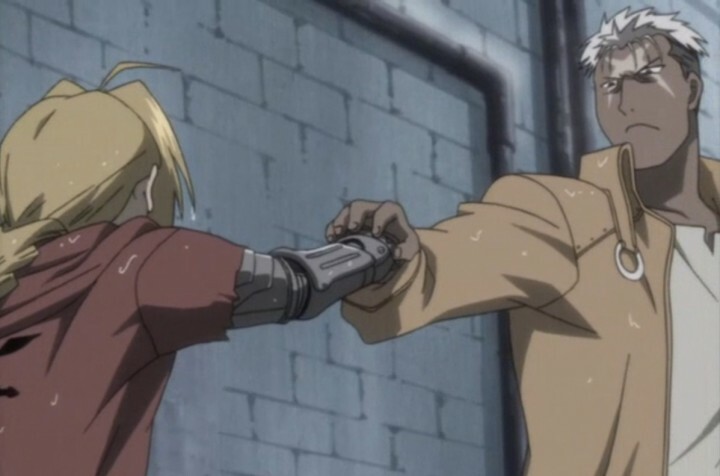 That 2003 anime is the subject of this review, and, despite its status as the “inferior” anime of Fullmetal Alchemist’s two adaptations, it’s just as strong a series as its older, more highly-regarded 2009 sister series. This is a review of the first half (episodes 1-25) of Fullmetal Alchemist (2003), and as such, still follows the source manga quite closely. This made it rather difficult to review, having just seen the 2009 Fullmetal Alchemist: Brotherhood. 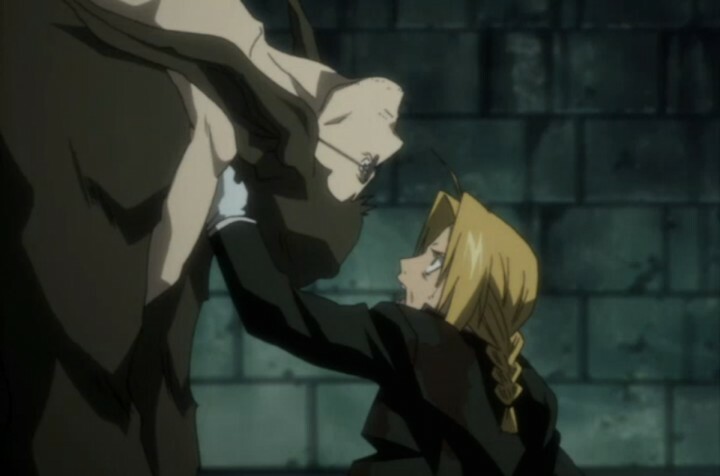 Both anime’s first halves are strikingly similar in plot and tone so, to avoid this review becoming a copy and paste job, I chose to emphasize the unique aspects that Fullmetal Alchemist (2003) offers, while touching on the important moments both adaptions happen to share. In short, I came away very impressed with this first half of the series, which features loss in a very meaningful way, as the series shows us, time and time again, how in order to obtain anything, something of equal value must be sacrificed. And although the series starts out innocently enough, in an almost-serialized crime drama sort of way, we’re exposed to the many sacrifices that these characters are forced to make, and it’s almost enough to break you and make you stop watching. But it’s this central struggle that makes Fullmetal Alchemist (2003) one of the most emotionally impactful anime I’ve ever seen. 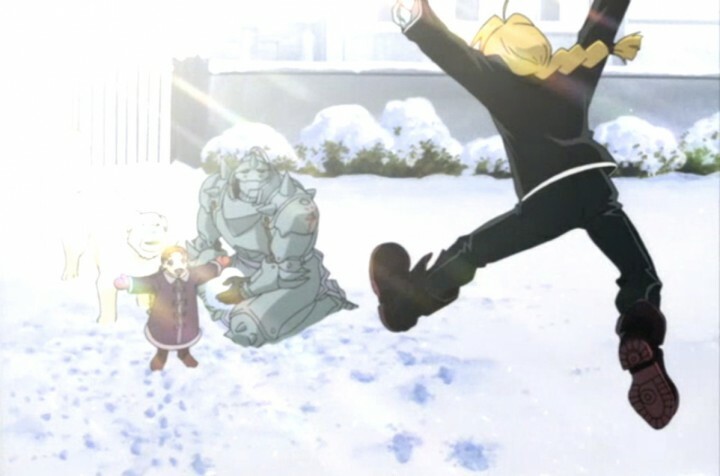 The start of this series starts out violently, as we’re shown just a glimpse of the terrible sin that would soon define the lives of our young protagonists, Edward and Alphonse Elric. But this glimpse ends abruptly as we’re ripped to the present day activities of the boys, with Alphonse’s soul bond to a metallic suit of armor and Edward having replaced one of his arms and legs with metal prosthetics. The anime takes care in these first few episodes to lay out the rules of alchemy very explicitly for the audience to understand exactly how the boys can repair radios without tools or craft lances from mounds of sand. After a while though, it became a little patronizing to hear Ed or Al explain the principle of equivalent exchange to someone. One would think that, in a world where alchemy is obviously such a big deal, everyone would at least have some idea of how it worked. Our first conflict with a corrupt preacher is a great intro-level conflict insofar that it supports the learning curve that is necessary to understand exactly why our protagonists are where they are in their young lives. It also helps introduce what has become known as the series’ trademark humor, which serves to interrupt even the most serious of moments with quirky, crude drawings of the characters in the scene. Most of these jokes are quick quips and don’t exactly feel out of place, even when they interject themselves in the middle of tense moments of conflict, although some may find them a bit jarring at first. However, in its darkest moments, like those in a flashback episode that explains the context of the gruesome first scene of the series, the show is unapologetically serious. In this one episode we see two young children literally ripped apart by their failed attempt to bring their mother back to life, their blood spilling on the floor as evidence of their sin. 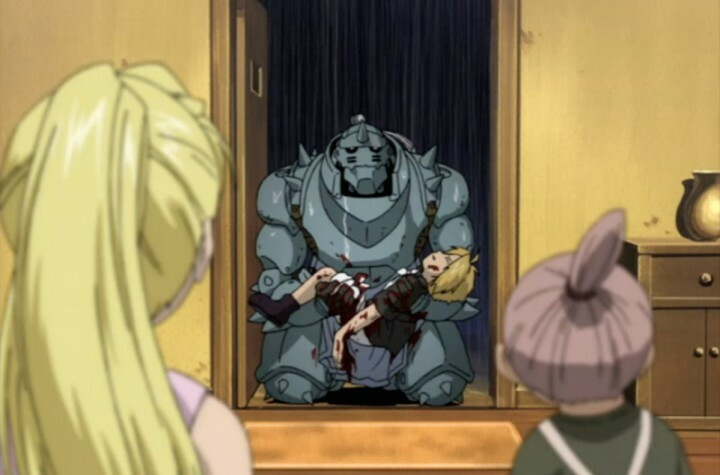 Fullmetal Alchemist, while quirky and funny one moment, isn’t afraid to show its audience the ugly side of alchemy, the gruesome, terrible aspects that lead young boys to think that they could bring their mother back with a simple formula or lead a middle-aged man to desperately try to replicate his long-lost love using grotesque methods. From here, we see our protagonists make their way to Central City to take their tests to become State Alchemists, those alchemists sponsored and funded by the government in exchange for becoming human weapons for the military. At least, that’s what I realized was happening but only after a few minutes of confusion. It’s not exactly clear from the outset of this journey that it’s still a flashback sequence or where exactly our brothers are traveling and why. In fact, this lack of clarity is something that I found odd, given the show’s earlier emphasis on explanation, perhaps adding to the jarring feeling I had. 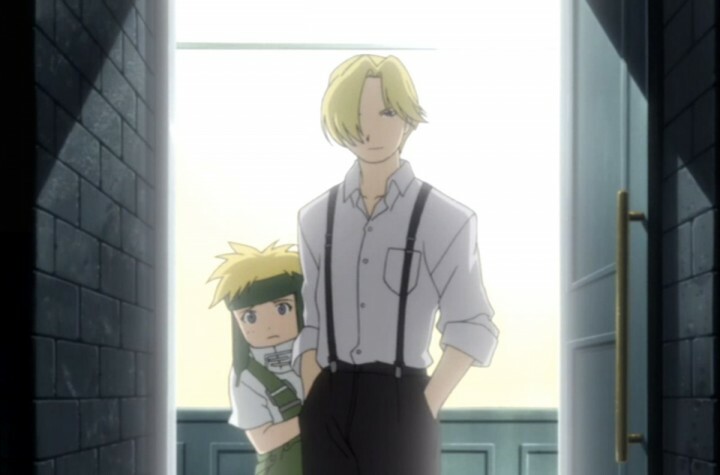 On the way to accomplishing his goal of becoming a State Alchemist in order to access classified research on human transmutation, Edward and his brother find themselves living with Shou Tucker, the Sewing Life alchemist. Here’s where the series decides to slow the proceedings down a bit and allow the audience to get comfortable with everything that’s happened thus far. It’s the small moments in these couple of episodes, like when Ed and Al play in the snow with Tucker’s daughter Nina or when the brothers help one of their allies’ wives give birth, that the show’s strengths really shine through. Although our time in each of these tranquil scenes is relatively short, it really lets us get to know our protagonists and their friends as people and not just characters on the screen. By empathizing with even ancillary characters like Maes Hughes or Nina, we grow a greater attachment to them and their relationships over time. It’s interesting that this series is so willing to play around with its pacing like this, just in order to have greater payoff later; it’s something we don’t see a lot of nowadays with our standard 24-episode-long series. Although this act is short, it’s almost entirely brutish and horrifying from beginning to end. In fact, as I was watching these scenes unfold with our various villains throughout this act, I couldn’t help but draw comparisons with Silence of the Lambs, and I mean that as a compliment to the anxiety these episodes made me feel. With the end of Shou Tucker’s storyline alone, it felt as if I had been watching some psychological thriller and not an anime at all. Seeing Tucker devolve from a caring family man to a deranged, Hannibal-like psychopath was as rewarding as it was soul-crushing. His quick 180 to the series’ worst-of-the-worst list was made all the more difficult because the series had spent so much time showing us that he was a caring father and dedicated teacher. But what really sealed the deal for me was Tucker’s emphasis that he and Edward were not so different, and that the two alchemists shared a passion for the science that could, and did, lead them to do terrible things to the people they love. Moving forward from this tragedy, we almost quite literally stumble upon the serial killer Barry and his obsession with killing young women. While his appearance in the show is rather coincidental, I did appreciate it for the realism it injected into the show. The typical anime hero, like Goku or Naruto, treat their first brush with death as if it were a joke, just another happening in their exciting lives. Edward’s first brush with his own mortality, however, is hardly heroic at all. 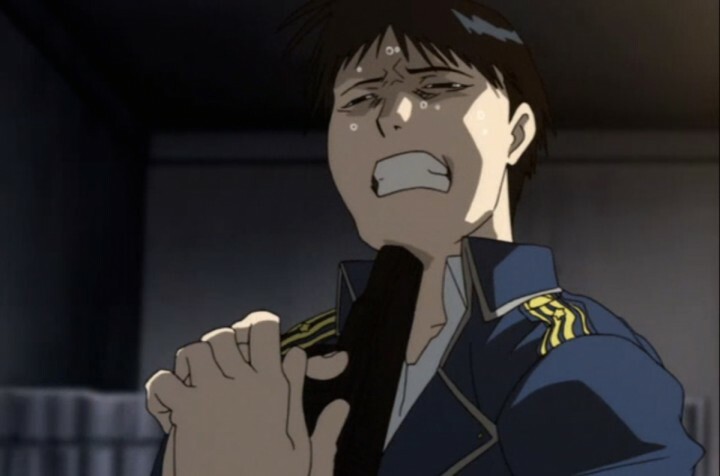 As he stumbles around on the ground, barely able to defend himself from the madman hacking at him with a meat cleaver, we see the terror in his eyes and we hear the dread in his screams for help; this isn’t your typical anime hero, this is a 12-year-old boy who had to grow up far too quickly. After two incredible villains in such a short time frame, it was slightly disappointing to see our heroes come into conflict with Lt. Yuki or Siren. Compared to the deranged Tucker or the unhinged Barry, Yuki’s corruption or Siren’s thievery puts them on the level of Saturday morning cartoon villains, at best. It was at this point that I had enough clarity to realize that the show’s storytelling had devolved into a very classic, but very outdated method of writing. The “monster of the week” style of storytelling, while suitable for crime dramas and even our earliest anime, leaves a lot to be desired when it goes wrong. This method of storytelling relies almost entirely on the antagonist in question, so when we get someone like Barry, it’s memorable and ground-breaking, all the while someone like Yuki elicits a brief chuckle or wag of the finger. This monster-of-the-week hunt, however, does fall away by the middle of this act, finally giving the audience some idea of what our protagonists are even trying to accomplish. Whereas the previous arc felt episodic in nature, this arc feels focused on providing meaningful conflicts whose consequences extend past an episode of two. While our first two-part conflict features a rather dull tale of two brothers impersonating the Elric Brothers, it does introduce the fact that many people in this world are actively seeking out the philosopher’s stone. A brief, yet entertaining sparring match with Colonel Mustang, the Flame Alchemist, gives Ed his best lead on the Philosopher’s Stone yet, a former state alchemist who abandoned his post, Dr. Marcoh. While this lead turns out to be slightly disappointing, it does introduce one of Fullmetal Alchemist’s darkest back stories, the Ishvalan Civil War, in the form of Scar, a madman on the hunt for State Alchemists. Scar’s sudden appearance, while terrifying, also serves to inform the audience that nearly every major character we’ve been introduced to thus far has blood on their hands to some degree, as the Ishvalan War was less a war and more like genocide. Its horrors continue to permeate throughout the series, either by psychologically damaging those like Mustang and Marcoh, or physically scarring those like Scar who survived the extermination. There’s something extremely haunting about seeing a young Mustang, who is normally so vibrant, put a gun to his head in an attempt to end his own guilt for having butchered so many. This is a series about the struggle to overcome loss and perhaps no arc exemplifies that fact better than this somber tale of war and its veterans. 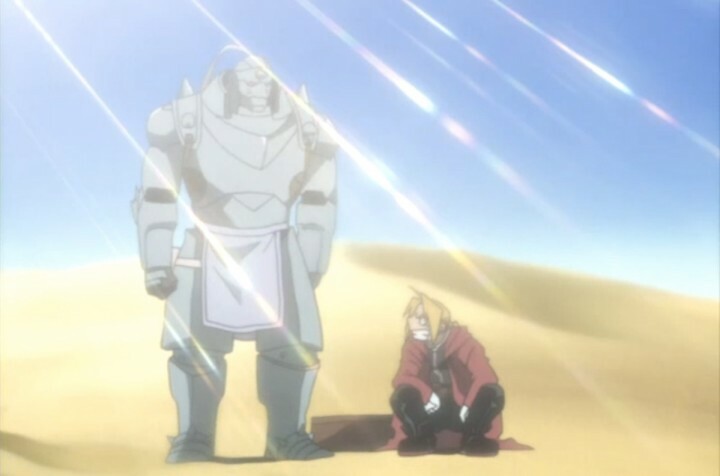 After a brief reprieve from fighting in their pastoral hometown, the Elric Brothers, having healed their bodies and minds, this arc acts as a series of consequences, both for our protagonists’ actions for the many characters they’ve come into conflict with throughout the series thus far. Old foes return to some mixed degrees of success but the new villains we are introduced to quickly put them to shame. 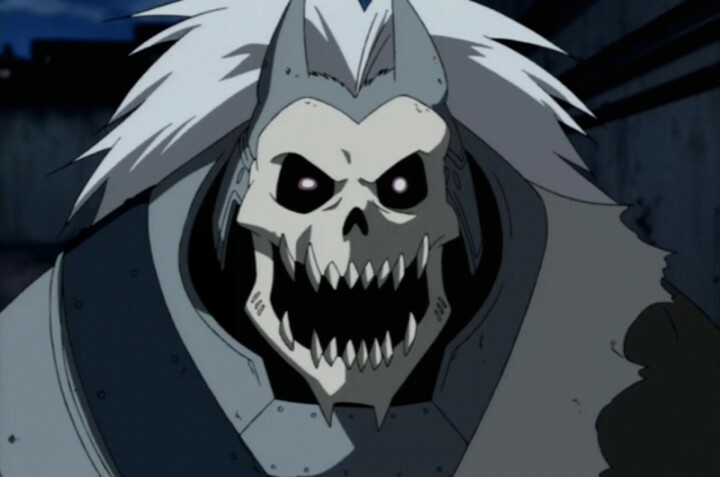 After embarking on a search for Dr. Marcoh’s research notes on the philosopher stone, Edward and Alphonse are quickly targeted by two ghosts from the past, Barry the Chopper, now soul-bound to a suit of armor, and Shou Tucker, now physically disfigured with the body of a chimera. However, three years after his initial introduction, Barry hardly inspires any sort of fear or terror. Without a human form to convey emotions, Barry’s sad relegation to a second-rate, cartoon-like villain only serves show just how much our protagonist have grown since the series’ earliest episodes. 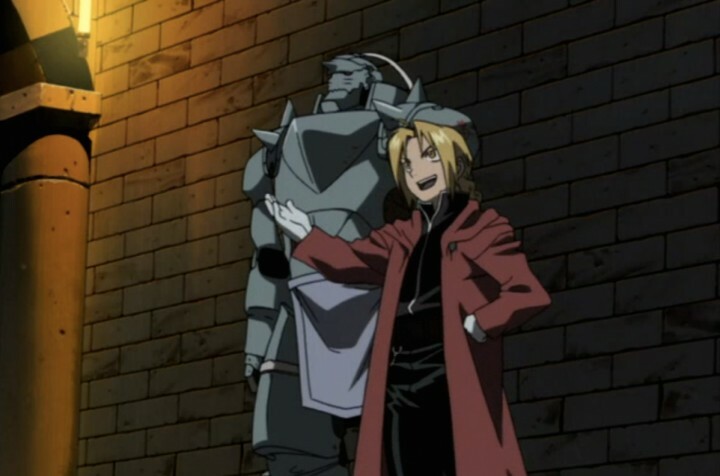 The best he can offer is a fairly unconvincing lie to Alphonse that he’s a manufactured soul in a suit of armor, and yet, somehow Alphonse buys into this. 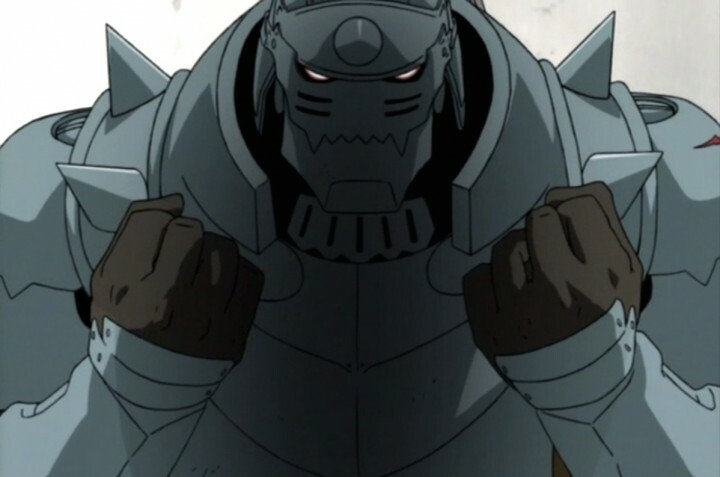 While I was struck by how easily he was fooled by the not-too-brilliant Barry, one has to remember that Alphonse is a 14-year-old boy; the massive suit of armor belies the fact that he’s really just a young, emotional boy who doesn’t have the whole world figured out. Speaking of old foes turning up again, Edward comes into conflict with the other half of what I consider the “Silence of the Lambs” duo, Shou Tucker, the monster that used his own family in his experiments, all for the sake of science. Seeing him again, in a more monstrous form that befits the sort of beast he really is and seeing his desperate attempts to bring back his family, somehow brought about all those old feelings again. It’s interesting that Tucker still elicited such a strong emotional response from me, whereas Barry fell flat; again, perhaps it’s Tucker’s still-human-like appearance that helps him in this area. 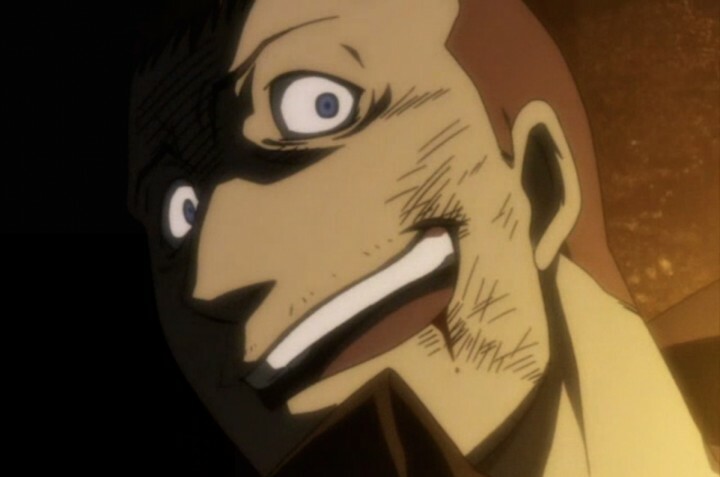 However terrifying Tucker still is, he pales in comparison to the real antagonists of the series, the Homunculi, artificially crafted humans with abnormal abilities ranging from perfect imitation to regeneration, all embodied by one of the seven deadly sins. These true monsters easily defeat our heroes, even managing to hold Alphonse hostage. 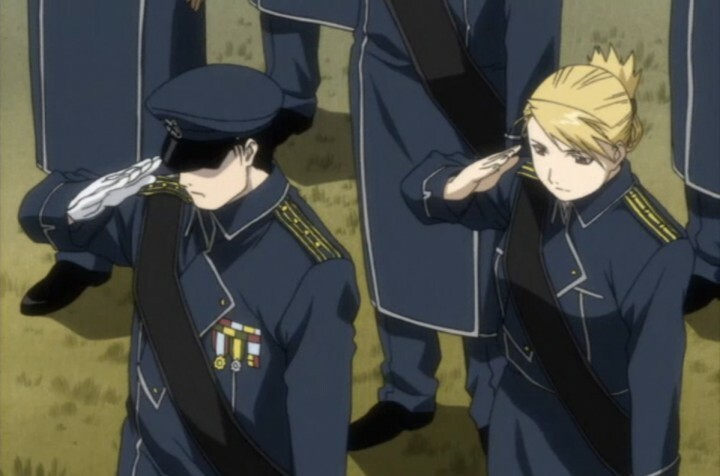 And finding out that they had been the puppet masters behind the series’ events thus far makes it all seem so pointless; all the struggle is seemingly for nothing and it demoralizes the audience just as much as it does Edward and Alphonse. After a narrow escape, this final act’s central conflict fails to elicit the same sort of emotional high that its predecessor accomplished so perfectly. Instead, we’re left two distinct halves of this act, a good one and a mediocre one. And although the good half shines through as one of the series’ high points, its accomplishments come only after one of the more disappointing conflicts we’ve seen thus far. The central catalyst of this mediocre conflict lies in the above-discussed fable from Barry the Chopper, leading Alphonse to strongly distrust his brother and his own friends. I really can’t emphasize enough how tiring this short-lived spat was, from inception to the ensuing side-show featuring some Ishvalan refugees. Call me heartless, but I just didn’t feel any sort of emotional attachment to this brotherly fight, as it felt like an artificial conflict meant to fill the time in between major events. The second half of this act, however, hit me hard, like square in the chest hard. For fear of spoiling this essential scene and its emotional impact, I’ll avoid any major spoilers and just tell you that the loss of major character comes out of seemingly nowhere and left me stunned for minutes after the episode had long ended. And what really cements this death for me is not the death itself, but the ripples it creates throughout the series as many characters react to this tragic loss of life. Grief is a powerful emotion, and one that fuels the actions of not only our main protagonists, but their many allies. And as this act concludes with tears streaming, it’s obvious that this particular grief will be the catalyst of many events to come, whether for justice or cold-hearted vengeance. Loss, pain, and grief permeate throughout this series like an aching pain. Watching our protagonists sacrifice so much, time and time again, is draining on an audience. We can only take so much pain in our daily lives and most treat entertainment like this series as a means of escape from that reality. But this series unapologetically confronts us with that reality, and somehow it’s hard to turn away. 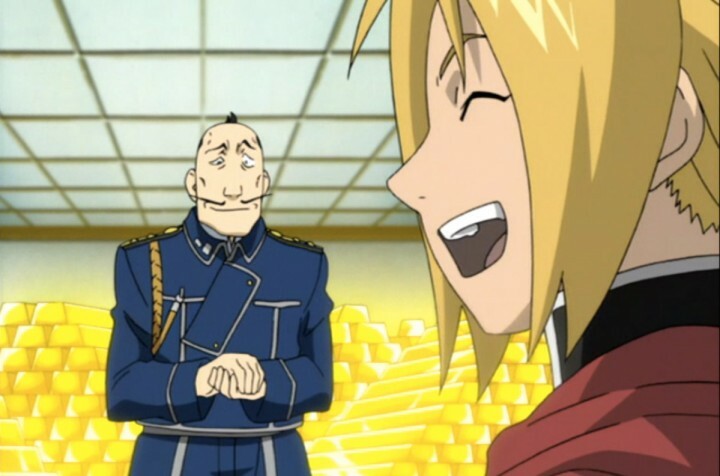 Fullmetal Alchemist (2003), while painful at times, is yet simultaneously hilarious, charming, and full of heart. 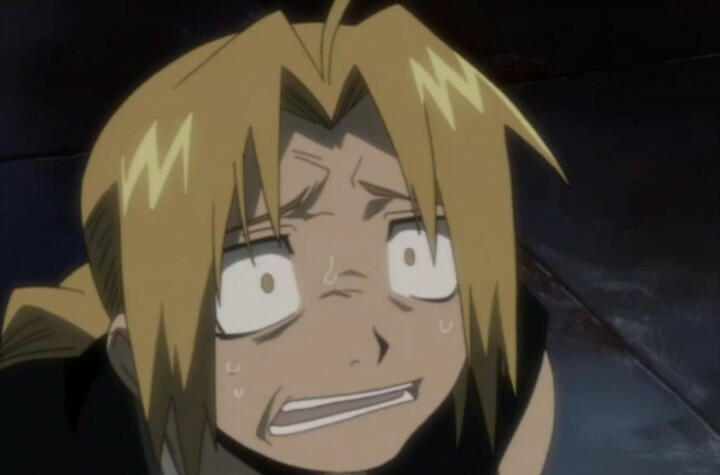 One moment I was grinning through another joke about Ed’s height, while the next I could be anxiously sitting at the edge of my seat, hoping everyone would survive. And that’s why this series is so captivating; it captures our attention with its memorable villains but rewards us with even more memorable characters and interactions that never fail to impress. This anime is so expertly written that it somehow manages to be everything all at once, while many series of similar length fail to do even one thing well.